A straight, even smile is both healthy and looks great on you! We want to help you and your family straighten your teeth. Today’s treatments are designed to improve the oral health of mouths at every age. Braces will require a few lifestyle changes. You will need to increase flossing and brushing as well as avoid foods that can damage your braces. The bottom line is, braces are an investment in a healthier mouth for years to come. It is not too late to straighten your smile! When your teeth are not properly aligned, it can lead to issues like plaque buildup, cavities, or uneven wear. Aligning your teeth now may help prevent oral problems later. We are excited to offer the Six Month Smiles system! What do we love about this system? These braces have one wire to straighten your teeth into a perfect smile. The wire does not require tightening, which means less overall maintenance than traditional braces. Your braces should be less noticeable because this system uses non-metal brackets and a tooth-colored wire. Did you know the American Association of Orthodontics recommends your child be evaluated by an orthodontist before age 7? In some cases, early correction can help prevent more serious problems and lengthy treatments later in life. 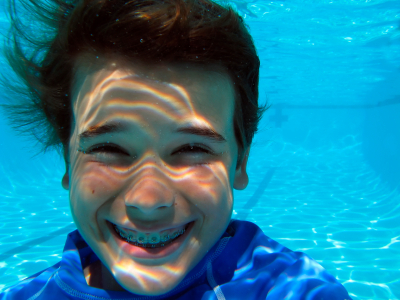 The key benefit to early braces is that your child’s teeth are still growing. This allows for guidance of the teeth while they are still developing, rather than waiting until they are already in place. Whether you think your child may need braces or not, bring your child in for an evaluation. We want to keep your child smiling for a lifetime! There are other concerns that an early evaluation can address: crossbites, crowding, and protruding teeth. Phase One intervention is prescribed for severe orthodontic problems that would be more difficult to correct once your child’s permanent teeth arrive. The goals are to ensure your child’s permanent teeth will grow into correct places and that your child’s jaw will be aligned well. Correcting these problems early on can benefit your child’s lifelong health and confidence. Forsus/Mara: This corrects an overbite by bringing the lower jaw forward. Bonded Upper Expander: This helps widen your child’s upper jaw to prevent crowding and ensure proper alignment. Transpalatal Bar/Nance: This keeps molars in place, so other teeth can straighten. Space Maintainer: This ensures the permanent tooth that is coming has enough room. These appliances are the most common interventions, but we may recommend others. If you are interested in what orthodontics can do for you and your family, call Battle Mountain Dental to schedule consultations today!